When my wife and two children (6 and 2) went to the beach to observe the turtle release, we were the first ones at the beach. It was a great time to snap some photos of the kids and to explore a "new to me" section of Orange Beach, near "The Palms" and "The Turquoise" condominiums. It is getting cooler so the kids played in the sand with their sand pales and shovels, my wife enjoyed the salt air and breeze and watched as her two smaller children played in the sand while her 32 year old child ran up and down the beach-line with a Nikon and Tripod. The folks in this image showed up shortly after us, sat up next to the trench and unfolded their chairs to watch the sunset. One of the things that struck me was the contrast between their point in life and ours. 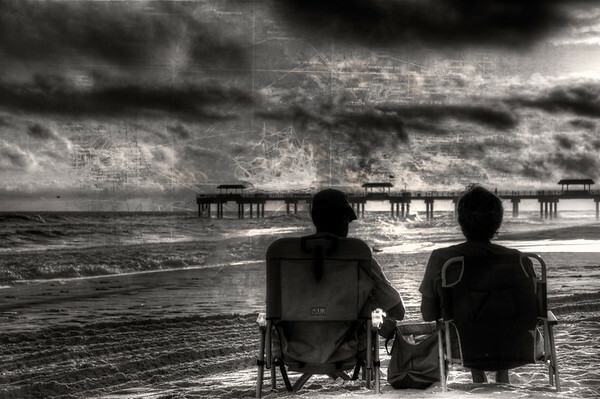 Two, younger retirees sitting on the beach at sunset, probably condo owners. Given their relative younger age, probably reasonably successful. What adventures have they had? Where have they travelled and where to next? What careers did they hold and how did they meet? Boxers or briefs? (okay, yeah that last would I don't really want to know.) Everyone has a story but I didn't have the opportunity to get theirs, unfortunately. I felt it inappropriate to invade their perfect moment with my weird queries but I did open up the shutter of my mystical light capturing device in order to forever imprison their binary doppelgängers on my DROBO. Coming from my station in life as a photographer, then network engineer, then programmer, then manager, then successful programmer again - turned failing photographer; two kids, wife, mortgage, at least two jobs; this scene was encouraging to me. The current hectic pace of my life will hopefully one day yield to a quiet, reflective time like this with my own loved ones.